My taxi around trip to visit Phnom Odong US$40.00. 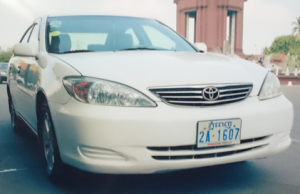 My taxi around trip to visit Tonle Batie and Chisor US$55.00. My taxi from Phnom Penh to Sihanouk Vill US$60.00. My taxi from Phnom Penh to Siem Reap US$75.00. Taxi van from Phnom Penh to Sihanouk Vill US$120.00. Taxi van from Phnom Penh to Siem Reap US$140.00. 3. We have 4WD for US$60.00 all day. 4. If you need a taxi to the more remote provinces of Cambodia, we can arrange for your travel to any of these destinations. Please let us know about your needs. 5. We have a private car with driver for rent on a monthly basic. The minimum is six months duration. The rate is US$850 per month plus the daily amount for gasoline. 6. We offer advanced hotel bookings at a 10-20% discount many hotels in Phnom Penh and Siem Reap. For journeys outside Phnom Penh due to the increased rates of petrol, the service will charge higher. These charge are subject to change because of such fluctuations in the global oil market and there fore are negotiable at the time one is due to arrive in Cambodia.